How can you make a beautiful evening in Gettysburg, Pennsylvania even better? Add in some live music at the end of your night to help you relax. Many of Gettysburg’s restaurants, breweries and wineries feature live, local musicians on the weekends. We’ve compiled a list of some of these spots to catch a tune! Reid’s Winery’s popularly attended weekend concert series, Music in the Valley, is held in the summer and fall at their home winery in Orrtanna, Pa. Buy a bottle of wine, bring a picnic lunch and take in the gorgeous mountain views as you listen to local musicians strum their tunes. Reid’s Winery also plays live music at their tasting room at the Cider House in Downtown Gettysburg. If you’re looking to finish your day with more history and a bite to eat, check out the entertainment at the beer garden at the Farnsworth House Inn Restaurant and Sweney’s Tavern. Local musicians play Civil War era music for those dining in the beer garden to enjoy. A new addition to the Farnsworth House is their alcoholic ice cream. It’s sure to hit the spot during those hot summer months! On many Friday nights, you can hear music coming from Knob Hall Winery’s Tasting Room on Chambersburg Street. With fantastic wines, craft beer, an inviting atmosphere, board games and live music, you’ll want to make it a point to stop at Knob Hall Winery on your next visit to Gettysburg. It’s the perfect place to unwind after a busy week! The Pike Restaurant a & Tap House offers a laid back atmosphere where you can kick back, enjoy a drink and listen to live bands. Check their Facebook page for updates on their live music schedule. The Pike is also known for being pet friendly, so bring your fur babies along for a treat! Every summer, Adams County Winery hosts Live on the Terrace at their farm winery. Let music fill your ears as you enjoy a signature wine cocktail at their beautiful farm. New wood-fired pizzas are a delicious addition to the event series this year. At Battlefield Brew Works you can sit back with a cold brew, or one of their spirits, and enjoy an evening of live music and good food. Follow them on Facebook for updates on bands they’re bringing in and other special events. Located in the historic W. H. Monfort Farm, Battlefield Brew Works has a fascinating history too! Live acoustical entertainment is available most Friday and Saturday nights at the Eagle & The Owl at Liberty Mountain Resort located just outside of Gettysburg in Carroll Valley, Pa. The resort offers golf in the warmer seasons, as well as skiing, snowboarding, snow tubing and ice skating in the winter. Take a break from your recreational activities for a bite to eat and beautiful music at the Eagle & The Owl. It’s hard to say what’s better at Jack’s Hard Cider – the drinks or the views. To make your experience at Jack’s Hard Cider even better, they offer live music often throughout the year. Pack a picnic to share with your significant other and turn it into a romantic date night. If you’re looking for more musical selections, check out Gettysburg’s theaters for musical productions and shows. 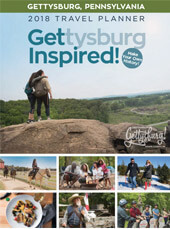 Also, during the first Friday of every month, Downtown Gettysburg hosts First Friday – Gettysburg Style. Many shops, tasting rooms and restaurants downtown bring in local musicians to add to the ambiance of these special evenings full of shopping, sales and food. Add in some music to your next Gettysburg getaway. The Gettysburg Brass ,with Bill School & Greg Ruth, trumpet; David Wenerd, trombone; Ben Jones, Tuba; Dan White, drum set, will be playing on the Dobbin House Patio, Friday, June 30 from 6-8. Sounds like a great event! Thank you for sharing! Another great spot for live music in Gettysburg! Garryowen is another great spot to catch live music in town!